The fifteenth issue of Marvel's ongoing Star Wars comic series will feature a flashback to Obi-Wan's exile on Tatooine, ComicBook.com revealed today. The story will explore the relationship between Obi-Wan and Owen Lars, Luke's uncle, and will reveal why Owen doesn't want that "crazy old wizard" around. 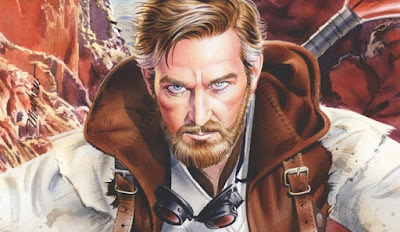 This is the second time Marvel's Star Wars, which is primarily set in the era between Episodes IV and V, has flashed back to Obi-Wan's exile on Tatooine with issue #7 being the first to do so. Issue #15 goes on sale on January 20th. • Another tale of Obi-Wan's exile on Tatooine! • Owen Lars took Luke in...but he refused to let Ben be part of his life. Why? • What trouble could have been stirred up by Ben protecting Luke? Are you excited for another Obi-Wan flashback story? Let us know in the comments. Why not just create a comic series set in that era? Is this canon story or not? All the current Marvel comics are canon.